Most parents dream of a good night’s sleep, especially in the early years. Once you move your little one from bassinet to crib, those crib rails start to look hard and harsh. That’s why bumpers first became popular. Rolling babies would hit a soft cushion instead of a stiff slat. But as research into SIDS (Sudden Infant Death Syndrome) and other causes of infant death expanded, studies suggested that crib bumpers are not safe. So, what is a cautious (and sleep-deprived!) parent to do? Many parents to seek alternatives to crib bumpers that fulfill the same role as a traditional bumper. What Is a Crib Bumper Used for? Crib bumpers support three key needs that help little ones sleep through the night. First, they prevent bumps from rolling in the night. Second, they prevent your child’s arms and legs from sliding between the rails. 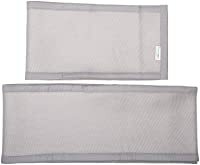 Third, crib bumpers can keep your child warmer by blocking drafty air. All of these can wake your child up in the night costing both of you valuable sleep. Reviewing baby sleep milestones can help you understand why people began using crib bumpers. Newborn: Newborns sleep about 17 hours in a 24 hour period. Typically, their sleep doesn’t follow a pattern. They wake frequently to eat because their stomach is small. 1 Month: Babies still sleep about 17 hours a day. They may start sleeping more at night because they start to get a pattern. 2 Months: Babies sleep about 16 hours a day. During the night, they will still wake up to feed. However, they may start to cut back on nighttime feedings. Also, they nap frequently during the daytime. 3 Months: Babies sleep about 16 hours each day. Some babies start to sleep for six to eight hours through the night. They still nap during the day with an average of three naps. 6 Months: Babies sleep about 15 hours. Many will sleep for 10 hours during the night. Also, their daytime naps are less frequent. Most babies only rest twice a day, during the morning and afternoon. 9 Months: Babies sleep about 14 hours. 11 of those hours are during the night. They continue two naps a day. However, your baby may get fussier about going to sleep because they start to feel separation anxiety. 12 Months: Babies sleep about 14 hours a day. They continue sleeping 11 hours at night with two daytime naps. However, the naps get shorter during this age. To support these important sleep milestones, parents must find a way to safely prevent the hard bumps, cold air and tangled limbs for each age. While parents have mixed feelings about the safety of crib bumpers, all professionals agree that parents should avoid crib bumpers. They pose a risk to child safety during the night. According to the American Academy of Pediatrics says you should never use crib bumpers. Also, Dr. Edward Kulich, The Baby Sleep Doctor, gives three reasons why parents should never use traditional crib bumpers. Babies don’t roll until 3 or 4 months old. So, they don’t need protection from the crib bars. If they do move, they won’t generate enough force for injury. Babies can roll face first into a bumper around 4 months old. This is the same health risk as sleeping with a pillow. They can possibly suffocate if they get stuck against a bumper. 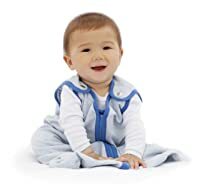 Babies begin to pull to a standing position at 9 months old. So, they can use a firm bumper as a step and fall out of the crib. From 2006 to 2012, 23 children died from crib bumpers. Some parents feel that this number is very low to pose a true risk. Other parents choose to take the cautious approach and avoid bumpers altogether. In addition to avoiding crib bumpers, parents should take other key steps for safe sleep. The following guidelines from the CDC explain how to keep your baby safe at night. Back is best! Always lay your baby to sleep on their back. Dress your baby in a fitted, one-piece sleeper for bed. Don’t overdress your baby for naps or bedtime. Use fitted bedding in your crib including the mattress and sheets. For safe sleep, you should consider alternatives to traditional crib bumpers. Many of these fulfill the same role while also complying with safe sleep tips. But you still need to sleep, right? For careful parents, alternatives to crib bumpers can help keep your baby’s limbs from slipping through the slats while also promoting safe sleep. The best options promote healthy sleeping habits and are easy to use. Each of the options below can keep your little one safe and sleeping soundly. 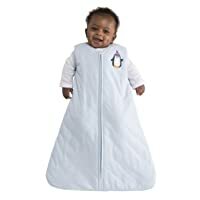 Baby sleeping bags are well-fitted sacks that close with Velcro, ties or zippers. Many of them allow you to swaddle your child. One inside the sack, the baby can still kick and squirm. They just can’t get a leg stuck between the crib bars. While this option won’t stop your infant from bumping his head, it will prevent limbs from passing between the slim spaces of the crib slats. Several retailers sell vertical bumper pads that attach individually to each crib slat. Compared to traditional bumpers, they have higher air flow and a lower risk of suffocation. For safety, crib slats should be less than 2 and ⅜ inches apart. 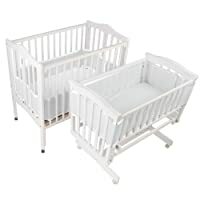 By adding these vertical crib bumpers, your child can’t stick their arms or legs through the rails. You can try this option too, and here is the most popular vertical crib bumper On Amazon. Some parents opt for a mesh bumper over the traditional style. They keep little arms and legs from pushing through the crib slats. Also, they provide some cushion from bumping against the rails. However, you should be careful to find one that collapses under a child’s weight. As your baby grows, they can use firm bumpers as a step to climb out of the crib. The table below can give an idea about some great mesh crib bumpers. Sleeping well is important for both parents and their little ones. Any new parent can appreciate the role crib bumpers play in helping infants sleep. But, you also need to consider the safest crib solutions to promote healthy sleeping. Finding alternatives to crib bumpers is a personal parenting choice. We’d love to hear about your experience getting your child to sleep safely. Did you use traditional crib bumpers or an alternative solution? Tell us your safe sleep tips and tricks in the comments. Video & Photos credits: Amazon, FOX 4 Now. 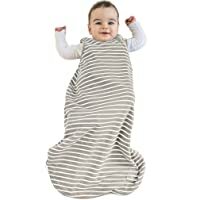 Many of my friends use the baby sleeping bags and say they work great. The individual bumpers are such a good idea too!